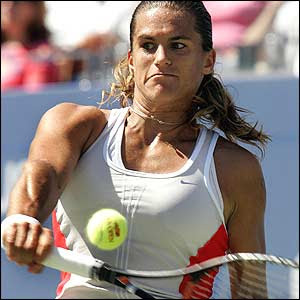 At the 2006 Australian Open, Mauresmo captured her first Grand Slam singles title, defeating Belgian former world number one players Kim Clijsters and Justine Henin-Hardenne en route. Both opponents retired from their respective matches, Clijsters with a right ankle sprain in the third set of their semifinal and Henin from gastroenteritis in the final. Mauresmo was leading in both matches — by 6-1, 2-0 against Henin-Hardenne. Mauresmo then won her next two tournaments, the Open Gaz de France tournament in Paris (defeating Pierce in the final) and the Proximus Diamond Games in Antwerp (defeating Clijsters in the final). In the Qatar Total Open in Doha, Mauresmo defeated Martina Hingis in a semifinal 6-2, 6-2 but lost to Nadia Petrova in the final 6-3, 7-5. Had she won the final, she would have immediately regained the No. 1 ranking from Clijsters. Nonetheless, the outcome was sufficient to ensure Mauresmo's return to the No. 1 ranking on March 20, 2006. This reflected the fact that neither Mauresmo nor Clijsters participated in the 2006 Pacific Life Open in Indian Wells, California. Thus, neither defended her ranking points from the 2005 tournament, which Clijsters won. Though now a Grand Slam champion and the top ranked player in the world, Mauresmo once again succumbed to the weight of national expectations at the French Open, losing to Czech teen Nicole Vaidišová 6-7(5-7), 6-1, 6-2 in the fourth round in front of a packed Court Philippe Chatrier crowd. Amelie MauresmoMauresmo next suffered a first round loss at the Wimbledon warm-up event in Eastbourne. Mauresmo and Kuznetsova won the doubles title there, which was their first as a team and Mauresmo's second overall. Mauresmo was the top seed at Wimbledon. She defeated Maria Sharapova in a semifinal and then came back from a first set blowout to defeat Henin-Hardenne in the final 2-6, 6-3, 6-4. The victory was Mauresmo's second Grand Slam singles title and first title on grass. She then pulled out of the Fed Cup World Group I playoff tie against the Czech Republic due to a groin injury sustained during Wimbledon. She also withdrew from the Rogers Cup in Montréal. Her next tournament was the Pilot Pen Tennis tournament in New Haven, Connecticut, where she lost in the quarterfinals to Lindsay Davenport 6-4, 7-5. At the 2006 U.S. Open, Mauresmo lost to Sharapova in a semifinal 6-0, 4-6, 6-0. It was the first time in the open era that a female semifinalist here lost two sets at love. Mauresmo then reached the final of the China Open, losing to Kuznetsova 6-4, 6-0. 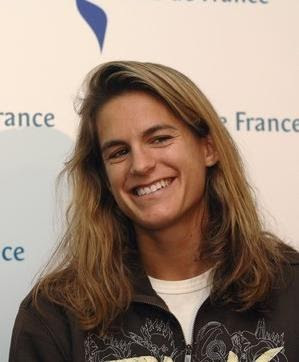 During the tournament, Mauresmo won 137 ranking points to help preserve her World No. 1 ranking and ended a nine match losing streak to Davenport. The last time Mauresmo had defeated Davenport was in Sydney in January 2000. To conclude the year, Mauresmo reached the final of the WTA Tour Championships in Madrid, losing to Henin and finishing the year ranked No. 3 behind Henin and Sharapova. Mauresmo started the year with a quarterfinal loss to Serb Jelena Jankovic in Sydney. At the Australian Open, Mauresmo lost in the fourth round to Lucie Safarova 6–4, 6–3 after winning her first three matches in straight sets. On March 16, 2007, Mauresmo received the Chevalier (Knight) of the Légion d'honneur from President Jacques Chirac. Going into the French Open, Mauresmo had played only three tournaments since the end of February. Mauresmo lost to Czech Lucie Šafá?ová in the third round 6–3, 7–6(4), committing eight double faults and 49 unforced errors.